With the highest pixel density yet in EIZO's ColorEdge lineup at an astonishing 185 ppi, 4K image display has never been so smooth. 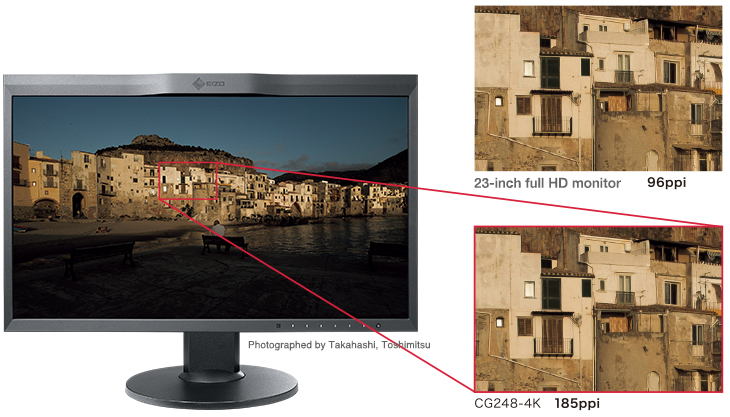 With the new ColorEdge CG248-4K monitor, now you can enjoy the exceptional detail in high-resolution photographs that cannot be reproduced with a standard monitor. Alphanumeric characters and contours are also distinguished with excellent sharpness for the printing workflow. The 4K ultra-high-definition (UHD) screen (3840 x 2160) is four times the size of full HD (1920 x 1080), making it ideal for high-resolution photography or as a reference monitor for 4K video creation. ColorEdge meets user needs with a wide range of monitors packed with features for creators of all levels. Designers and printers can rest assured that ColorEdge will ensure a smooth and consistent workflow through to the back-end. Video creators can take advantage of the features that many ColorEdge models include specifically for video creation. Those who want to enjoy working with digital photography can easily carry out color matching using ColorEdge. All of these features and more are included to ensure that ColorEdge is optimal for users' creative needs.